When I looked back on this post from March 2012 I thought it was worth bringing out again. Ireland has such a rich and beautiful culture. Enjoy! Happy March! This month I have a special request. As the granddaughter of Irish immigrants, I’m perpetually frustrated by school St. Patrick’s Day celebrations. Our elementary schools seem to equate Ireland with Lucky Charms cereal and older students apparently believe the rivers in Ireland flow with green beer. Ick. So here’s my request. If your school recognizes St. Patrick’s Day, how about teaching something about genuine Irish culture? Tell stories of leprechauns, to be sure, but don’t let it end there–and, of course, make space for some Irish-focused creativity. Here are just a few places to begin. Teach about illuminated manuscripts, which use elaborate drawings and designs to emphasize the ideas in the text. One of the most famous illuminated manuscripts in the world is The Book of Kells, housed in Trinity College in Dublin. Show some of the illustrations offered in several places online, including About.com’s gallery. When The Book of Kells was created, there were very few books and virtually all illuminated manuscripts were scriptural. Talk about what kinds of documents might be illuminated today. Have students experiment with illuminating real or fictional documents. Consider how the illuminations should highlight key ideas. How could a fairy tale be illuminated? The U.S Constitution? The Gettysburg address? Share some Irish music. Use the example of The Chieftains to demonstrate how diverse musical traditions can be merged (a good example of the SCAMPER verb “Combine”). For example, their recording Further Down the Old Plank Road combines Irish music with American Country, while The Chieftains in China links to Asian traditions. Challenge students to create music that links multiple traditions. Talk about storytelling and tell some stories. While not claiming to be a scholarly study of folklore, The Irish Storyteller website is one site that does a nice job of presenting stories “for the young at heart.” Talk about how stories grow and change over time. Practice the skill of elaboration by telling stories, adding descriptions to bring them to life. 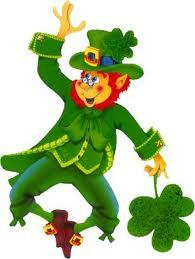 And let’s not leave out the leprechaun stories or art. Talk about how leprechaun tales are linked to the geography and weather of Ireland—lots of green and lots of rain for rainbows. Then decide, would leprechauns want live in your area? What might they do there? Or better yet, what kinds of “little people” might be unique to your area? How about potato fairies in Idaho? What would they be like? I love picturing them living in underground potato beds, perhaps bound in stealing butter! How about lobster leprechauns in Maine? Think about your own area, and let the writing and artwork begin. Enjoy something genuinely Irish this year. Oh, and eat some soda bread—traditional, or a bit more contemporary. I’ll be eating mine in my green sequined sneakers. They may not be exactly Irish, but they sure are fun. I think illuminating texts would be a great lesson. Even as I hope I never have to teach language arts again, I’m sure at some point I will.